These packages are termed organic falls and can be anything from a school of jellyfish to a coconut tree. The two most studied types are wood (wood falls) and the carcasses of whales (whale falls, see picture below). Because of the scarcity of food, when organic falls reach the seafloor, they prompt a feeding bonanza. Deep-sea creatures gather from hundreds of metres away to gorge on the new food source. Organic falls are not only extremely important in fulfilling the nutritional needs of many deep-sea species but they also provide shelter and substratum for many animals. What we would have liked to find! 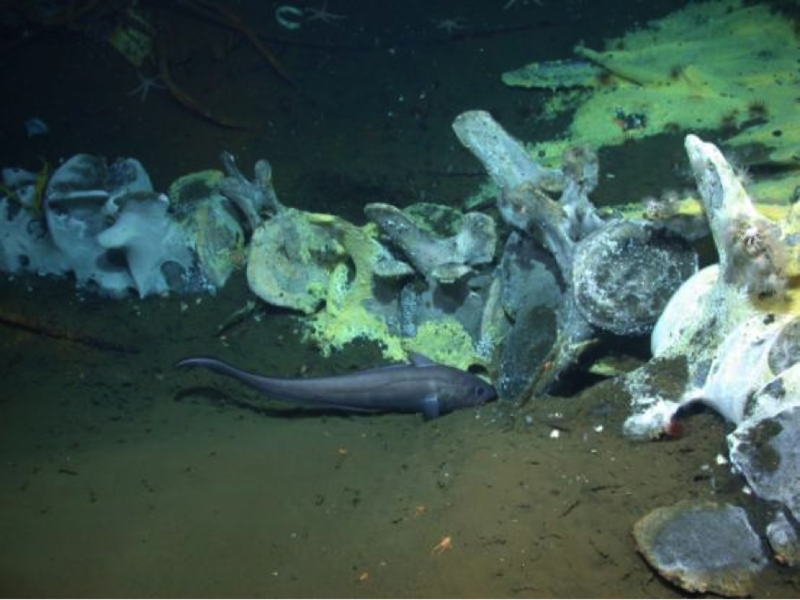 A whale skeleton in the enrichment-opportunist stage off California. Note the yellow and white bacterial mats covering the vertebrae of the skeleton. A rattail fish can be seen in the foreground. Photo courtesy of Craig Smith. As scientists visit the deep sea so infrequently, the chances of us stumbling across an organic fall are very low. There is no sure way of finding these bonanzas of life apart from driving straight over them with an underwater vehicle! We will leave down colonisation experiments including bone, wood, and different types of surfaces, which can be compared with identical experiments around the world. This will allow us to observe what larvae settle on these substrates in the Cayman deep sea and whether they are specialised to do this or just opportunistic. Our experiments will be collected from the seafloor by our Japanese colleagues in July with their Human-Operated-Vehicle, Shinkai 6500, to provide those answers. So why is this important you might ask? Organic falls are some of the more poorly-studied environments in the deep sea. In previous deployments, many of the species found using and colonising organic falls were new to science. Experiments like these have never been done in the Cayman Trench and should give us the chance to document the biodiversity in this part of the deep sea. Many of these species and families also overlap with those at other chemosynthetic ecosystems like hydrothermal vents and cold seeps. It is thought that organic falls act as stepping stones for deep-sea chemosynthetic fauna dispersing between vents and seeps and vice versa because of the similarities between the habitats. Our deployments will enable us to look at the dispersal of fauna between these isolated deep-sea environments and also perhaps provide us with insight into how these fauna are able to find and settle on these packages in such a vast expanse of ocean. We should also be able to put the fauna observed into an evolutionary context helping us to understand better how they fit into the tree of life and also perhaps how life originated, as many scientists believe, in the deep sea at chemosynthetic ecosystems. Very cool! Have you filmed any scavenging? Thank you so much for your question! There was a lot of evidence of scavenging - a good bit more flesh seemed to have gone each time we visited the pig, although we seem to keep missing the big scavengers. On one occasion we did find a large fish eating, possibly a cusk eel. There was a galatheid on another occasion and some shrimp, possibly Sergestes. The only scavenging fauna that were present every time we visited were amphipods, some of which were quite large.